TROPHY ELK HUNTING IN COLORADO FOR TROPHY BULL ELK ON 5000+ ACRES HIGH FENCE. BULL BASIN RANCH OFFERING Guided ELK HUNTING Specializing in 400 inch trophy bull elk and RECORD BOOK BULLS scoring over 600 inches. We have taken OVER 200 bulls in the 400+ to 500+ range in the past three years & many world records. The best guaranteed elk hunts & prices on guided elk hunts. BULL BASIN RANCH CIMARRON COLORADO HOME TO WORLD CLASS ELK HUNTING. BULL BASIN RANCH with Lee Cox. TROPHY ELK HUNTING on our Family’s beautiful ranch In the beautiful Colorado Mountains, amazing scenery, 5 star lodge & meals ,one of the most exciting elk hunts. WE are known for monster bull elk, amazing scenery & a truly special hunting experience. Are trophy elk hunts start at around 300 inch bulls & we take a lot of 400-500 plus bulls every season. We will custom build a hunt to meet your needs no matter your physical abilities or if you want a really challenging hunt we can offer that as well. Our ranch is mostly flat mountain plateau, but has some big rough areas as well along with huge valleys for those wanting a more rugged hunt. One of the most scenic elk hunting ranches in all North America. New for 2020 we will offer a classic wall tent hunt as well as the lodge. An elk hunt at bull basin is what dreams are made of. Beautiful majestic mountain scenery spruce pine forest , Quaking Aspen Stands, huge mountain parks, streams, lakes full of trout, as pretty as it gets. Our Ranch is mostly flat easy to get around on country being a high mountain plateau with amazing views in every direction, The largest private herd of elk with exceptional quality bulls in North America, luxury lodging, fine dinning, fantastic professional staff -that is what we are all about the best elk hunt out there. Hunting for a trophy bull in the beautiful high country of Colorado. Imagine seeing over a 100 head of elk each day of hunting with 40-50 bulls mixed in, cool mountain air wind blowing through the pine trees and elk bugling everywhere. BULL BASIN RANCH sets on a mostly flat mountain plateau with Majestic Mountain peaks and breath taking views. We offer over 5000 acres of hunting areas in beautiful elk habitat. Our ranch is mostly flat terrain easy walking with big valleys and some steeper terrain and deeper valleys surrounded by mountain peaks in all directions. Hunting in the aspens, blue spruce pine forest huge open sage parks with one of North America's greatest elk herds. Youl have found the elk hunt that dreams are made of . BULL BASIN RANCH recognized BY SAFARI CLUB INTERNATIONAL as the number one elk hunt in all North America. Featured in magazines and several sports shows as the best elk hunting experience out there. BULL BASIN RANCH with our 5 star world class accommodations, beautiful scenery & our vast elk herd - there is no better elk hunt. We have private land hunting License, No draw required and you can hunt with rifle or bow from September 1 though end November 30. Lee Cox Owner -operator of BULL Basin Ranch I have over 25 years in guiding elk hunts and building & operating one of the finest hunting ranches in all North America. We have an OUTSTANDING REPUTATION and strive to be the best elk hunting operation in NORTH AMERICA . With the very best guides and staff, one of the finest gourmet chefs. We offer the best elk hunt for the price with a 100 percent hunter satisfaction . For the quality of the hunting experience ,lodging, food , scenery, staff and most of all beautiful massive typical bulls we can not be beat..
TROPHY BULL ELK HUNTS with 100% past hunter success and satisfaction. There our other hunts out there ,buy only one BULL BASIN elk hunt. No other ranch comes close to our quality of bull elk , our massive estate ranch offers a true free range hunting experience, beautiful mountain setting , 5 star luxury lodge , and our staff is amazing. Our ranch is mostly flat high mountain terrain very easy terrain for walking & hunting. WE are very family oriented with many hunters bringing there wives along , father- son hunts and an first class corporate hunts. Our past hunters have ranged in age from 92 years old to 12 years old. Bull basin offers one of the best quality elk hunting experiences for huge trophy bull elk, our high fence area is so large it has a Free range quality hunting experience. One of the largest elk hunting preserves in North America for huge trophy bull elk., fine dinning and 5 star lodging ,great staff and guides,and the most beautiful mountain scenery all these factors set us far apart from any other ranches. We are the absolute best hunt for your money out there ,second to no other ranch . 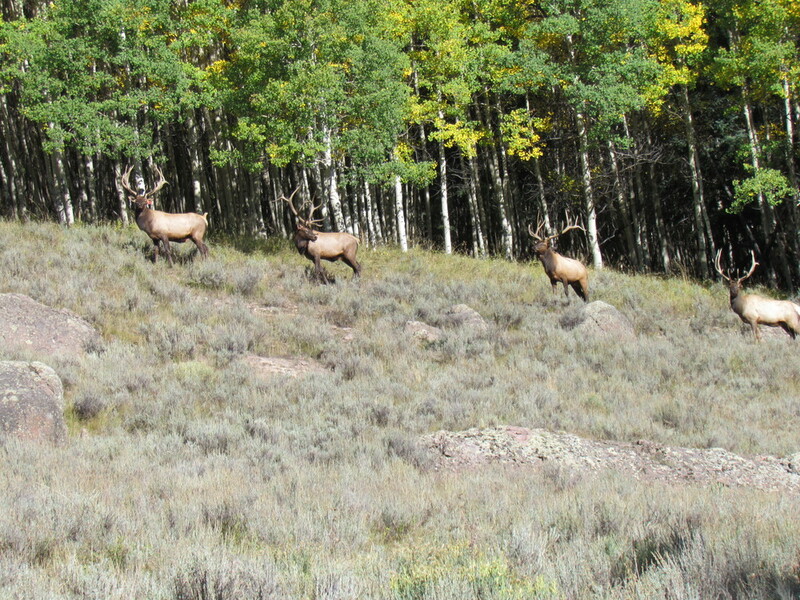 YOU CAN HUNT DURING THE ELK RUT FROM SEPTEMBER 1 THROUGH OCTOBER 31 WITH A RIFLE OR BOW ANY WEAPON. WE CAN HELP YOU CUSTOMIZE YOUR HUNT TO MEET ANY OF YOUR ABILITIES AND NEEDS. BULL BASIN RANCH -We are the only true free range quality elk hunting estate ranch. We can meet any hunters needs and abilities on or ranch. With our huge area and vast herds of elk our high fence hunts are as close to free range elk hunts as you can get with great numbers of elk on the ranch to ensure the success of your hunt . Most of our clients like to walk traditional spot and stalk hunting and cover lots of area while others chose to set some of the high mountain parks and many ponds and streams to find there bull as well as driving around . Many different abilities and ways to hunt and at the end of a very memorable hunt a magnificent bull elk to top it all off. WHAT SETS BULL BASIN RANCH APART FROM OTHER ELK HUNTING RANCHES ( THE HUNTING EXPERIENCE ) and all that goes with it.... You will have an amazing elk hunting ranch putting you in some of the most beautiful mountain scenery and amazing elk hunting with one of the largest herds of elk in North America ,along with great food , wonderful lodging and some of the best guides and staff in the business. We will build your hunt around your needs that will exceed any expectations . You can not find a better guaranteed elk hunting ranch for quality and price. You will get the best hunting experience for the price out there , beautiful typical trophy elk , amazing food, first class lodging, the best experienced elk guides and staff. You might find a place a little cheaper ,but is it worth the difference there are some very poor operations out there and you might end up disappointed. We are a 100 % on satisfaction with our hunters and that is the most important item to us. " your 100% satisfaction " We are"North America's # 1 elk hunting destination". BULL BASIN RANCH is one of the most beautiful ranches in Colorado and is the most scenic ranch you will ever hunt on. We are only 45-50 minutes out of Montrose Colorado and a quick 50 minutes from the Montrose airport . We have very modern log lodge with 7 rooms each with private shower , queen & king size beds ,WIFI. we have several thousand acres of prime Colorado trophy bull elk hunting. The ranch is 7,800 to 9,600 feet in elevation with a mostly level terrain. The ranch has a very diverse topography, lakes, streams, covered with blue spruce pine, Douglas fir pine, white spruce, vast aspen tree stands, , high mountain alpine sage parks, and high mountain meadows and many high mountains lakes and streams. In the fall our ranch is breath taking. Bull Basin Ranch is the ideal habitat for elk with the huge heard of elk that roams or ranch we can guarantee you a successful elk hunt. During the fall elk rut the elk herds can be found feeding in the big open mountain parks in the evenings and in the more secluded meadows in the mornings then moving into the dark timber for the middle of the day. Hearing bull elk bugle back in the dark timber and calling bulls in during the elk rut is one of the most amazing hunting experiences that there is in all of hunting! As the aspen trees on the ranch turn golden yellow, signaling fall, you can start to hear the ringing of elk bugles all over the ranch! With the high density of bull elk on the ranch the elk bugles can be heard continually through out the ranch during September and October. With a high bull to cow ratio and monster 400 inch plus typical bulls through out the ranch it is an amazing site to see during the fall elk rut. With the beautiful scenery and vast numbers of elk there is no place with a better setting to be hunting trophy elk at bull basin ranch Cimarron Colorado. Fall is that time of year that we look forward to all year the rocky mountain elk hunt is underway. We would like to invite you to come out experience a true rocky mountain hunt elk with us and experience one of the greatest hunts of your life! WHATS INCLUDED : TROPHY ELK HUNTS prices covers lodging 3 nights , four days hunting and all meals, guiding, field prep of your trophy capping for taxidermy. We have several very good meat processing businesses in the area that can take care of your elk and also ship right to you, If you are driving or flying we can ship your elk meat out any were in the lower 48 states. We also work with some outstanding guys who do great Taxidermy work to finish off your hunt . TROPHY ELK HUNTING success. 2014 & 2018 were great years at bull basin ranch . We had amazing groups of hunters and really enjoyed the time we shared with them.